We’ll create a unique; French inspired dining experience in your home. Our dream is to create an authentic Parisian dining experience for you, in the comfort of your own home. Through a variety of 3 course menu options or up to a 6-course degustation, Romuald’s bespoke culinary experience will transport your senses. We will provide you with our seasonal menu options, tailored to your occasion, along with the opportunity to speak directly with Michelin Star chef, Romuald to further personalise your menu. We can cater for 6 up to 30 guests. 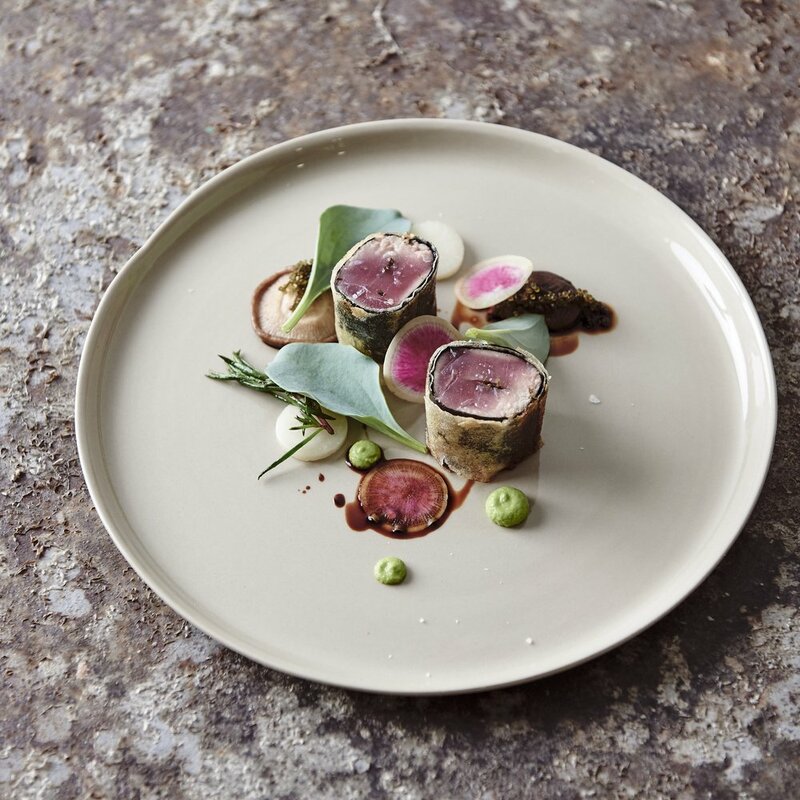 French born, Romuald Oudeyer has a wealth of experience in the kitchen, having worked in highly renowned restaurants across Europe and Australia. After completing 6 years of study at the Loire Valley Hospitality School, Ecole hotelier du Val de Loire, Romuald launched his career at Michelin Star restaurant, Château La Roche Le Roy in the Touraine region in the West of France. At 21 years of age, Romuald moved to Paris, where he commenced work at Michelin Star restaurant La Truffière - a gastronomic restaurant known for its truffle dishes in the winter, its ever-evolving menu, endless creativity, and perfection all year round. This established Parisian restaurant is where Romuald mastered his sophisticated style of cooking, along side esteemed Chef, Jean-Christophe Rizet. Romuald’s wife, Liz was living in Paris at the time they met and fell in love... it was not long after, that they chose to relocate their lives to Liz’s home, in Melbourne. Since then, Romuald has immersed himself in Melbourne’s thriving hospitality scene, working for two of the city’s finest restaurants, The Reymond family’s Bistro Gitan and Frank Camora’s, Mo Vida Aqui. Today, Romuald wants to share his experience and love of French cuisine with you, in your most familiar space - your home. romu offers multiple menus at varied prices and are happy to discuss alternative options to bring your vision to life. CHAPTER 3. ROMUALD BECOMES romu. was created by Romuald and his wife, Liz, who together share a passion for food. Romuald insists on working with the highest quality, seasonal produce. His style of cooking embodies an elegance and grandeur reminiscent of the finest restaurants in Paris. With an acute eye for detail and refined technique, he is consistent in producing intricate, visually pleasing, and above all, incredibly delicious dishes. Approaching his work from a worldly perspective, Romuald finds inspiration in variety of cuisines from across the globe. Everyday, Romuald is influenced by the people he meets; from industry professionals, to independent local producers and suppliers. It’s these influencers who continuously challenge his thinking and keep him on the pulse.